It's that time of year where the Summer weekends start getting booked up and before we know it we'll be at Labor Day and staring Fall in the face. I am determined to make the most of the nice weather while it's here though, so have already squeezed in a couple of outings and am looking to get a lot more in before the end of Summer. Last Sunday I made use of a gift certificate for golf that a friend gave me a while back. 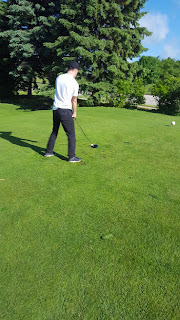 I went to Moor Downs with Ben and we golfed nine holes. There were several memorable moments or comments. When Ben pointed out how ludicrous the sport is and what it must have been like when the Scotsman told his friend, "Yeah, see this little ball? Well there's a hole in the ground to hell and gone over there, and you have to hit it into it." We laughed about how it probably took them playing a hole or two to determine that having a flag in it would make it easier to see. In a 9 hole outing, between the two of us, we must have lost a dozen golf balls. We were being pushed a bit by the "capable" golfers behind us hacks, so we never spent more than a couple of minutes looking for a ball. We have a zillion of them in our basement, and we both determined that life is too short to spend more than 5 minutes looking for a $1.00 golf ball. That a golf cart for two golfers, one with a hook and another with a slice, is really a waste of money. Scoring is for people who care or are good at golf. When you think you've cleared the water, you probably did not. Golf is a rich man's sport and is 98% a mental game. Life is too short for a really bad drive. Take as many (up to 3) until you're happy with one. If you can't do it in 3, move along. One sliced drive he had managed to send one of his balls a fairway over. When we golfed the next hole, lo and behold there was his ball. Bonus! Take away one stroke. The best part of the day was being with my son for a couple of hours. I love his wit and his laugh. We were a bit like Bill Murray and Rodney Dangerfield out there. It helps that neither of us will likely ever take the sport seriously, but it sure is fun farting around on a nice day.